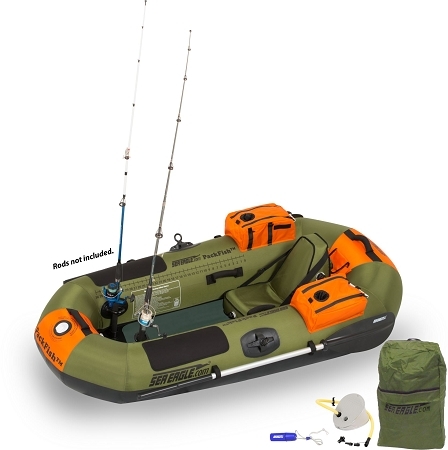 Sea Eagle PackFish7™ is a unique, ultralight, incredibly portable, one man fishing boat that can be used two ways: (1) fished for hours while sitting on the comfortable inflatable Deluxe Fishing Seat, (2) standing with the wooden floorboard which provides stable and ample standing area for both sight fishing and casting. The hull weighs only 21 lbs. and fully loaded with floorboard, oars and seat a mere 32 lbs. It goes anywhere, sets up in under 5 minutes and can even be worn on your back! It's as simple as that! We call it the "grab and go fishing boat!" Two Built-In 36" Fish Rulers. The PackFish7™ has not one but two conveniently located 36" Fish Rulers! No more worrying about forgetting, losing, dropping, rusting or the malfunctioning of one of your most important fishing tools! Two Pouch Pockets with Cup Holders for Tackle and Tools. Use the two conveniently located Pouch Pockets to store your tackle and tools with our Quik-2-Zip™ double zipper system for quick & easy access. Additional hook and loop straps keep your favorite tools at the ready. And of course, a must have is your cup holders. Two Built-In Industrial Strength Rod Holders. Two built-in, industrial strength rod holders have been strategically placed for ease of use and trolling. Able to withstand even the most rigorous abuse from the most demanding of fishermen! 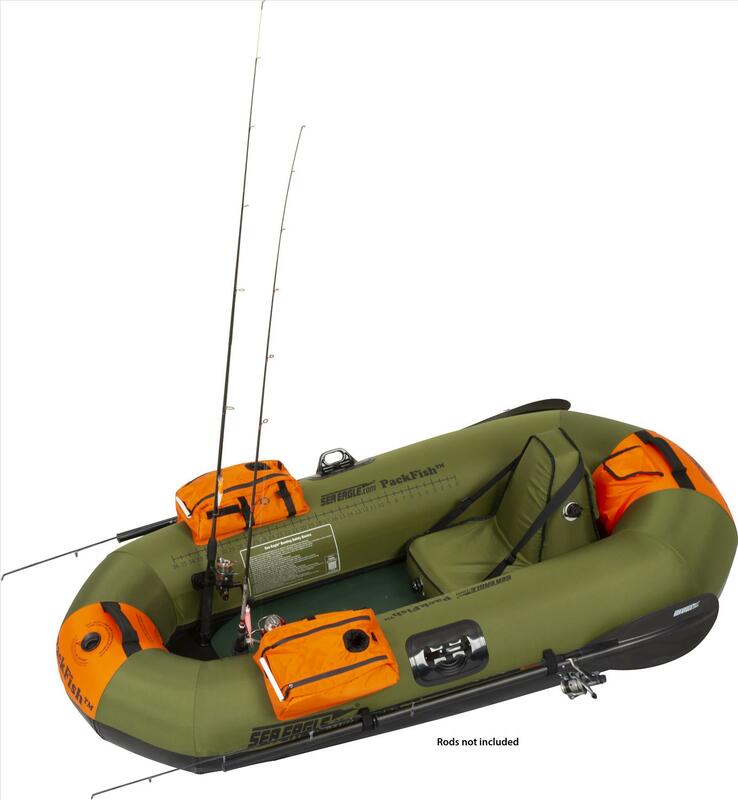 Side hook and loop straps second as additional secure rod holders and work great for getting rods conveniently out of the way when not in use! Four Tracking Strips. 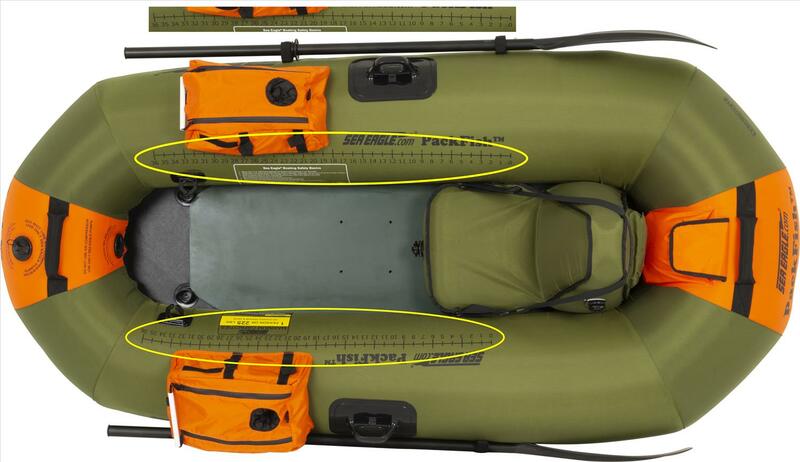 Four tracking strips to assist you when fighting those really big fish, increase stability and reduce being blown around by the wind.